To view the original post by Lenay Ruhl on CPBJ, click here. 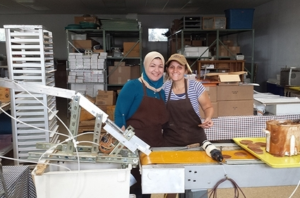 Suha, left, a refugee from Iraq, helps to make Stroopies with The Stroopie Co. co-owner Jennie Groff. The Stroopie Co., winner of last year’s business plan competition in Lancaster, is on schedule to open a brick-and-mortar store downtown in time for the Memorial Day weekend. The cookie bakery will open at 141 N. Duke St., and operate as Lancaster Sweet Shoppe. The Shoppe will sell Stroopies — known traditionally as Dutch Stroopwafel in Holland — as well as Groff’s Candy and Pine View Dairy ice cream, both from Lancaster County. 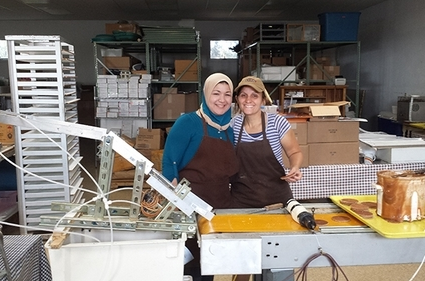 The Stroopie Co., owned by Jonathan and Jennie Groff, employs refugees. The company was the winner of last year’s Great Social Enterprise Pitch, an annual business plan competition in Lancaster, hosted by ASSETS Lancaster and the Lancaster County Community Foundation. Since winning the competition last fall, the company is thriving. Although spring is typically a slower season for the sweet, waffle-like cookies, The Stroopie Co. is making double what it was making at this time last year, according to Jennie Groff. Today, The Stroopie Co. has three part-time employees — one from Burma and two from Iraq — as well as a full-time manager who is also certified to teach English as a second language. The manager is teaching the employees English on the clock after their lunch breaks. “Being able to provide meaningful jobs is at the forefront of what we’re doing,” Jennie Groff said. Meaningful jobs are also at the forefront of this year’s competition, which is focusing on ideas that develop or support thriving, living-wage jobs for people who face barriers to employment. This week, ASSETS and the Lancaster County Community Foundation announced that it’s time for this year’s competition, which defines social enterprises as any for-profit or nonprofit business that uses the power of the marketplace to address social issues, according to a news release. An informational meeting will be held at the Lancaster County Community Foundation on March 24 at 6 p.m. for those interested in competing. Jennie Groff has some words of wisdom for entrepreneurs thinking about participating this year. “Business startups are not for the faint of heart,” Groff said, especially when you’re adding a social component. The competition is a time commitment. Although Groff had her husband, Jonathan, and four children to worry about, finding time to participate in the competition, which includes weekly evening meetings, was worth it. “It was exactly what we need to propel us into this next season,” Groff said. The Stroopie Co. was established as a social enterprise, but one thing Groff stressed is that if you have an existing business, think about a way to turn it into a social enterprise. “There’s creative room to think about what are the ways we can think socially with our business model that’s already existing?” Groff said. It’s worth it, even if you don’t win. “The process of even going through the Great Enterprise training, for me, was so helpful,” Groff said. She said it helped her gain confidence in presenting her idea and sharing what she had been doing. Even if she hadn’t won, it was useful in gaining affirmation from other participants and fine-tuning her business plan. “For businesses, especially those just starting out or exploring an idea, I would recommend it to anybody, because it’s going to be so well worth the time,” Groff said.